dotConnect Universal offers universal access to data of different databases for the Microsoft .NET Framework. It supports most of major database servers, including Microsoft SQL Server, Microsoft Access, Oracle, DB2, MySQL, PostgreSQL, SQLite, InterBase, and Firebird. Other servers can be accessed through their ADO.NET, OLE DB and ODBC providers. dotConnect Universal is based on ADO.NET technology and can be used in the same way as the SQL Server .NET Data Provider. The main feature of dotConnect Universal is an access to multiple database servers at the same code. With dotConnect Universal it is possible to avoid writing conditional code for different providers or using ADO.NET interfaces directly. dotConnect Universal implements full support of design-time development and integration with IDE, which allows to reduce development time greatly. dotConnect Universal doesn't implement database specific access layer for all databases, it uses native ADO.NET providers and depends on their functionality. 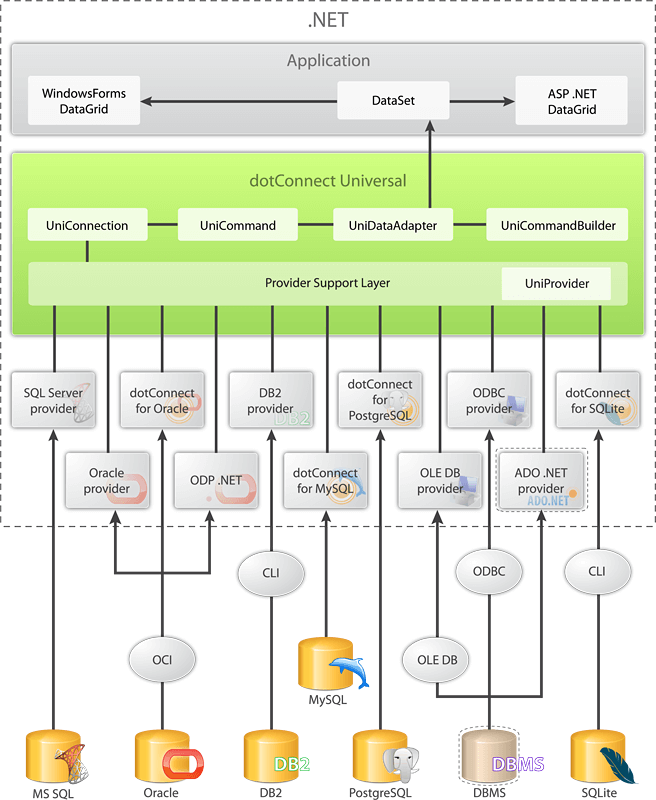 The Professional Edition of dotConnect Universal includes bundled data providers for Oracle, MySQL and PostgreSQL (see diagram below). For all other servers you need a native data provider. dotConnect Universal provides functionality for connecting to a database, executing commands, and retrieving results. These results can be processed directly or placed in an ADO.NET DataSet for further processing in disconnected state. While in the DataSet, data can be exposed to the user, combined with other data from multiple sources, or passed remotely between tiers. Any processing performed on the data in the DataSet can then be reconciled with the database. The following diagram illustrates dotConnect Universal architecture. The green area represents some of dotConnect Universal components. The lime area unites bundled providers in the Professional Edition. The rest of the diagram objects represent data access elements inside and outside of the .NET Framework. There are core classes that make up dotConnect Universal. The following table describes those classes and their functions. UniConnection - Establishes a connection to the database server and begins a transaction. UniCommand - Executes SQL statements and stored procedures at database, and exposes parameters. UniDataReader - Exposes and reads a forward-only stream of data from the database. UniDataAdapter - Populates a DataSet and resolves updates with the database. UniTransaction - Manages database transactions. UniParameter - Defines input, output, and return value parameters for commands and stored procedures. UniException - Returned when an error is encountered on a database. Along with the core classes listed in the preceding table, dotConnect Universal also contains the classes extending its base functionality and allowing to accomplish additional tasks. UniCommandBuilder - A helper object that will automatically generate command properties of UniDataAdapter and populate the UniParameter collection of UniCommand object. UniConnectionStringBuilder - Designed to construct a connection string by assigning values to appropriate properties. UniMonitor - Monitors dynamic SQL execution in applications that use dotConnect Universal. 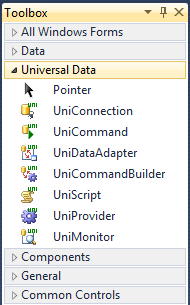 UniProvider - Represents a custom ADO .NET data provider which can be used with dotConnect Universal provider. UniScript - Executes series of SQL statements separated by special symbols. The following list presents the main advantages of the dotConnect Universal. dotConnect Universal is shipped with support for a set of ADO.NET providers. The free Standard Edition of dotConnect Universal doesn't include any of the supported providers. You need to install necessary providers separately. Note that Standard Edition does not work with Expression Editions of the dotConnect providers. The Professional Edition of dotConnect Universal includes the dotConnect for Oracle, dotConnect for MySQL, dotConnect for PostgreSQL, and dotConnect for SQLite data providers (run time of the Standard Edition of these providers). The .NET Framework Data Provider for SQL Server uses its own protocol to communicate with SQL Server. It is lightweight and performs well because it is optimized to access a SQL Server directly without adding an OLE DB or Open Database Connectivity (ODBC) layer. The .NET Framework Data Provider for OLE DB uses native OLE DB through COM interop to enable data access. The .NET Framework Data Provider for ODBC uses native ODBC Driver Manager through COM interop to enable data access. The .NET Framework Data Provider for Oracle enables data access to Oracle data sources through Oracle client connectivity software. The data provider supports Oracle client software version 8.1.7 and later. The provider for MS Access enables data access to Microsoft Access data sources through OLE DB. Recommended for single-tier applications using Microsoft Access databases. dotConnect for Oracle provides direct access to Oracle database server with or without the Oracle Call Interface (OCI). The data provider supports Oracle Client software version 8.0 and later. dotConnect for MySQL is a data provider for direct access to MySQL database server for the Microsoft .NET Framework. The data provider can access MySQL server either using native MySQL network protocol directly or through MySQL client library. dotConnect for PostgreSQL is a data provider for direct access to PostgreSQL database for the Microsoft .NET Framework. The data provider uses native message-based protocol for communication with PostgreSQL database server. dotConnect for SQLite is a data provider for direct access to SQLite database for the Microsoft .NET Framework. The Oracle Data Provider for .NET enables data access to Oracle data sources through Oracle client connectivity software. The data provider supports Oracle client software version 9.2 and later. The DB2 .NET Data Provider allows your .NET applications to access Version 8 DB2 Universal Database on Windows, UNIX, and Linux-based computers, and Version 6 and Version 7 of DB2 Universal Database for OS/390 and z/OS via DB2 Connect. The .NET Data Provider for Firebird 1.x, 2.0, and InterBase 7.5 databases. Available for .NET Framework 2.0 only. Any provider not listed here still can be used with dotConnect Universal. Refer to dotConnect Universal and Arbitrary Data Providers topic in the documentation. You can get a significant discount, and even a free license, by spreading a word about dotConnect Universal. Fast, ORM-enabled, and feature-rich ADO.NET provider for SQLite with support for Entity Framework, NHibernate, and LinqConnect ORMs.